Thanks for the REALLY great article! Very detailed, awesome topics covered. To be honest, there is much potential in archived logs, but mainly as an additional backup safeguard. I haven’t played with them to understand how much of a performance benefit there is (surely they are faster than replaying binary logs, but how much faster than applying logs from multiple incremental backups). The granularity of replaying binary logs up until a specific point in time (or rather binlog position) I would imagine is easier. From an operational point of view, finding a particular statement / binlog position is timely enough (especially on high load servers), having to identify the associated LSN is even tougher – in order to take advantage of point in time backups using archived logs. Off to go check out this new functionality, thanks again for the article. just what I was looking for, thanks Vlad. Можно ли имея достаточно большие по обьему “redo logs” восстановить хронологию изменения данных ? Восстановить из этой хронологии таблицу после “drop table” ? > I haven’t played with them to understand how much of a performance benefit there is (surely they are faster than replaying binary logs, but how much faster than applying logs from multiple incremental backups). 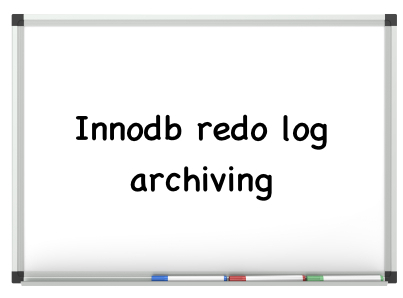 Yes, I think it’s a good idea to do performance comparison between binary log and innodb redo log applying. > Можно ли имея достаточно большие по обьему “redo logs” восстановить хронологию изменения данных ? I will translate this question into English. So Ivan asked if it is possible to have some kind of data history and restore data to the certain point of time even after “drop table”. This feature implies having some initial state – initial backup made with xtrabackup. After that we can apply operations from archived logs to this initial state to have new state. It is possible to apply archived logs up to the certain LSN. In such a way we can restore innodb state up to the certain point in time. Also it is possible to find the LSN before “drop table” statement execution(for example using some tools for printing out the commands from innodb log file) and apply archived logs up to this LSN so we will have the state of dropped table just before it’s removing. Then we can for example dump this table and restore it on prod. What kind of tools do you say? This article is very good and it is what I am looking for. I am an Oracle, Sybase and SQL Server DBA. I like to know the depth of the implementation of database behind. From my experience with point in time recovery, Sybase replication, oracle data guard, SQL Server always on (mirror, logshiping), although I am new to MySQL, I have an impression that the MySQL binary log has the transaction inconsistent issue. I am looking for if there is any product or the function inMySQL to archive the redo log and apply the archived log to do point in time recovery and replicate for innodb. From my experience of Sybase replication, the replication of binary log in row mode has bad performance and limitation.